I asked BE trainer Hayley Newman what were the worst mistakes that she saw at BE80 and 90 level. Riders should have done a couple of dressage tests, preferably one on grass. Jumped some showjumping rounds above the height they will be competing at and away from home over strange fillers. Had a few sessions cross country schooling building confidence. Make sure you jump a question followed by an easy fence out schooling to keep yours and the horses confidence high. Hacking – make sure you are cantering out hacking and in balance. Going through puddles, up and down inclines and in and out of dark. Many riders cannot balance for long enough out of the saddle. This will take practice and perseverance! Practice out hacking or when you are in the arena. Most cross countrys are about 5 minutes long so practice for this length of time and slightly over. 3) Competitions are not for practice. Do not go to a competition without having done your homework and expect the horse to learn along the way. You are setting yourself up for a disappointing day and wasting your money. Competitions are for testing everything you have done at home. Too often riders neglect their own fitness and that of the horses. 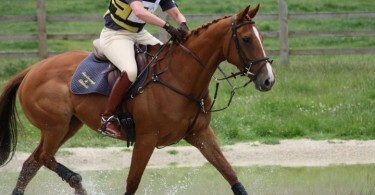 Riders should be fit enough to ride at a fast canter for over 5 minutes and feel ok at the end of it. An unfit rider is an unfair rider to their horse. Horses doing BE80/90 level do not need to go especially galloping but they should be able to spend over 5 minutes in canter without blowing really hard. 5) Riders should understand the scales of training – they need to understand about a balanced canter and about different gears. Yellow Cards – 2015 So Far!